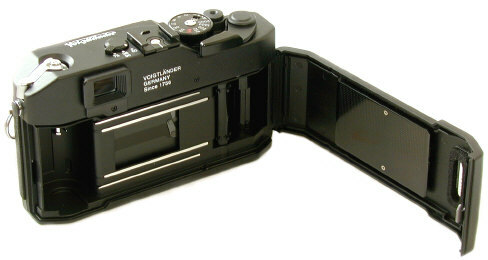 Cosina introduced its new Voigtlander Bessa R2 February 20, 2002. It went on sale in Japan on April 1st 2002. 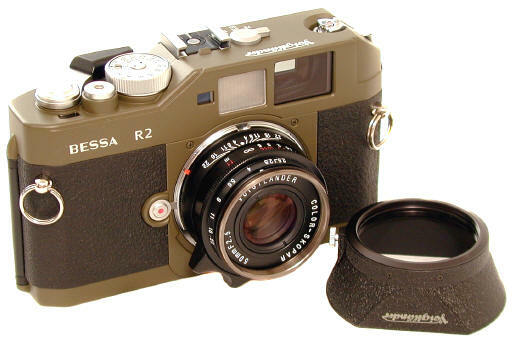 The R2 is a much improved Bessa R, with Leica M mount instead of Screw Mount, Metal exterior body, Trigger Winder capability, comfortable Ratcheted film advance, and much improved body covering and scratch-resistant splatter paint finish. The R2 was discontinued July 2004. Translation for the Rangefinder impaired: Cosina Voigtlander is taking dead aim at the introductory level M mount market, the same market which Leica has ignored for close to a half a century. Things are getting interesting in the world of 35mm Rangefinders. 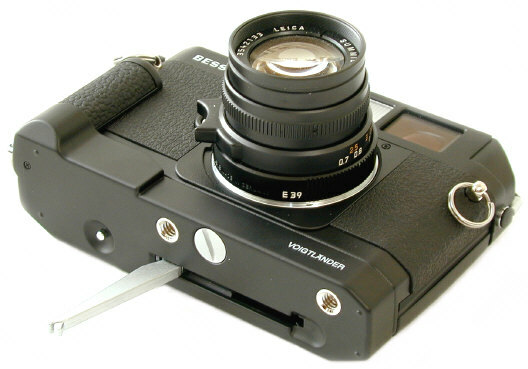 A new compact 7 element 50/2.5 Color Skopar lens was introduced with the Bessa R2. The 50/2.5 is available in black or silver. A rectangular lens shade is optional. Why use a Trigger Winder? A Trigger Winder is just another way to advance the film. You still use the top mounted shutter release. With practice you can shoot 3 frames per second without the battery dependency of a motordrive. 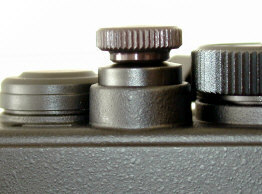 If you are left eyed, you will probably find the Trigger Winder much more convenient than hitting your forehead with the right handed lever film advance. The Trigger Winder also provides a comfortable grip, as well as strap lugs for mounting the camera vertically rather than horizontally. Some photogs prefer adding the vertical Grip B, which provides a palm rest while using the Trigger Winder -- just like a similar grip for classic Canon rangefinder trigger wind advances. Grip B screws into the tripod socket at the end of the winder baseplate. Try the Trigger winder, you might be surprised. A MUCH heftier and substantial classic camera feel. Words don't really suffice. The R2 feels like a much heftier camera than the Bessa R, not just an upgraded R.
The dull splatter paint finish in either black or olive is new for Voigtlander. It is an uneven dull finish, which seems to promise a much more scratch-resistant finish than smooth glossy paint finishes. The Body Covering is much improved over previous Bessas. The R2 body covering is a textured rubber which practically seems to "hold" onto your hand. To my hands at least, this is an exceptionally comfortable camera to hold and carry, due to the very graspable body covering and the molded palm grip on the back door. Upgraded cast magnesium top cover, bottom covers, and back door replaced the plastic composite covers and film door on previous Bessas. 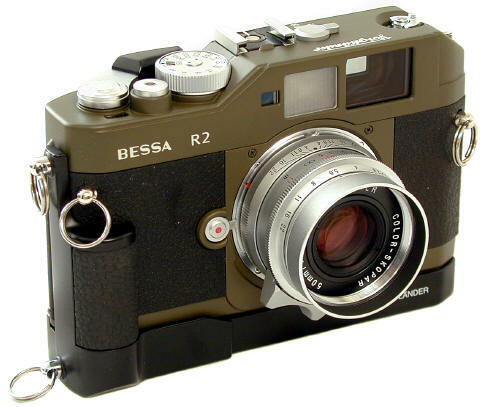 Rapid winder capability -the R2 uses the same Trigger Winder as the Bessa T. The R does not take a winder. 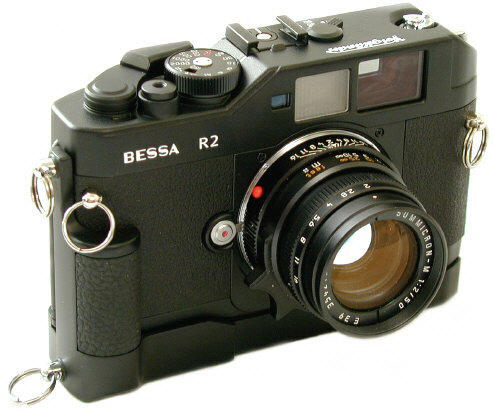 The Bessa L, R, T, and R2 all use the same mechanical Copal shutter with a 2nd outer set of blades to keep it light tight. Side by side, the R2 is not quieter than the R, but the shutter sound does sound a bit more "metallic" to my ears. However, I am nitpicking. In practical terms, there is no difference in the shutter sounds of the four cameras. To my ears at least, the Bessa sounds like a quiet SLR, but they are not as quiet as a Leica M (or other cloth shutter RF's). VERY Bright Viewfinder, Rangefinder spot, and framelines, many photogs find it as bright or brighter than the Leica M6, believe it or not. The Bessa R or R2 do not have the occasional Rangefinder Patch flare of the M6 which can make the M6 patch virtually disappear under some lighting conditions. However, you do have to be careful to keep your eye centered in the R2 RF/VF for optimum viewing. Viewfinder .68 magnification, RF baselength of 37mm, with an Effective RF baselength 25.16 -- or 51% as long as the standard .72 Leica M finder with EBL of 49.32. Rangefinder coupled close focus is .9 meters. If a particular lens allows closer focusing than .9 meters, set focus using the distance scale focusing on the lens barrel. TTL ambient light Metering with superb 3 LED readout in finder: VERY easy to see and adjust. There are 3 red LEDs at the bottom of the finder. They are marked +, -, and 0, just adjust shutter speeds or f/stops until the middle LED is lit The meter ONLY works if the shutter is cocked, a feature to not only save batteries, but also to let you know your camera is ready to take the next shot. Turn the meter on by pressing down slightly on the shutter release, it will automatically go off after about 10 seconds. Meter range EV 1 to 19 with 100 film (f/1.4 at 1 second to f/16 at 1/2000th), film speed range from 25 to 3200, change the film speed by lifting the shutter speed dial and rotating it to get the desired film speed in the indicator window. 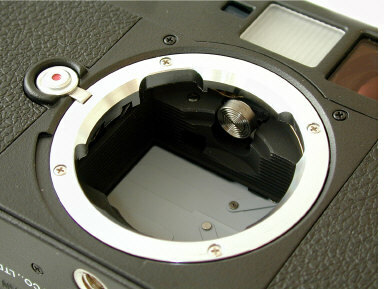 The centerweighted meter cell is located in the top of the lens chamber near the rangefinder cam. It reads ambient light reflected light off the outer gray shutter. Blocked Meter Cell: Be aware that some deeply recessed lenses may fit just fine, only to block the meter cell which reads reflected light off the shutter curtains. After you mount a deeply recessed lens successfully, take a test meter reading, to make sure that particular lens gives the same meter reading as your other lenses. Shutter speeds from 1-1/2000th plus B, 1/125th flash (Leica M's have a top speed of 1/1000th and a flash sync of 1/50th. Mechanical vertical traveling metal Copal shutter which works at all speeds without batteries (unlike the Leica M7). It is louder than the Leica M's, sounding about the same as a quiet SLR. Standard Copal shutters in SLRs are not completely light tight. They don't have to be, since the SLR mirror is forming a light seal in front of the shutter practically all the time except during exposure. This is not true for rangefinder cameras, so a 2nd outer light tight shutter covers the inner shutter in the Voigtlander Bessas. Cable Release: The shutter release is threaded for a standard mechanical cable release -- no special $75 electronic cable release as required on some autofocus SLR wonders is required. Rewind the film by pushing in on the rewind button on the baseplate, and using the large film rewind lever. With a rewind button in the base of the Trigger Winder, you can also rewind film with the Trigger Winder attached. To put it in perspective, the R2 is the 1st economy priced Leica M mount camera with built in rangefinder and viewfinder since the Leica CL of the 1970's. At this point in time, the R2 seems to be a MUCH better camera than the CL. I would not be surprised to see the R2 become the standard entry level M camera, and a best seller at that. Even for Leica M6TTL and M7 owners, the little R2 makes sense as a 2nd body because the R2 has features the expensive Leicas lack: 1/2000th top speed, 1/125th flash sync, and flash capability even with dead camera batteries. Don't forget that the R2 is a "return to basics" and a belief in KISS (Keep it Simple Stupid). The electronic do everything autofocus SLRs are indeed wonders, but if the batteries die. they are just another expensive paperweight. 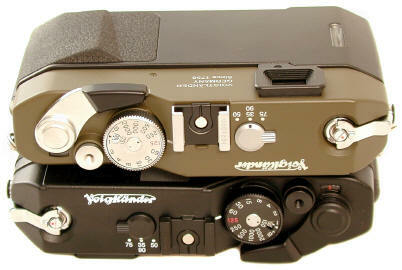 Mechanical cameras like the Voigtlander Bessas take pics without batteries. If you take out the R2's LED meter, its basic design could have come off a 1960's camera production line. Perhaps even more importantly, the R2 is a camera you can have fun with taking great pics -- not a bad combination at all. The big deal of the R2 is Leica M mount. I think the R2 will become very popular as THE 1st choice as an entry level M mount rangefinder. 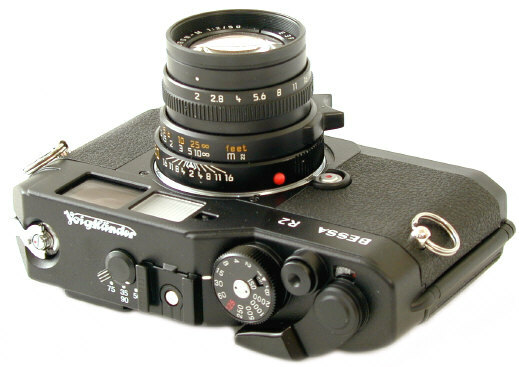 Unlike the Konica RF, I have heard of no Leica M lens incompatibility problems with the Voigtlander Bessas. Note the collar on the lens release, and the outer gray shutter which reflects light for the TTL metering cell. This pic also shows the texture of both the body covering and the splatter black paint finish quite well. Unlike ANY production Leica screw mount or M mount rangefinder, the Bessa R2 is easy to load even for first timers. The film reminder window is a nice practical touch. The R2's shutter release is smooth and comfortable, but Tom Abrahamsson's Black or chrome MiniSoftrelease makes the shutter release even more comfortable-- just like its big brother SoftRelease improves the shutter release of the fabled Leica M6 and M7. Do yourself a favor. If you own any of the Cosina Voigtlander Bessas, buy the MiniSoftrelease. In practical terms, the R2 amounts to a MUCH upgraded Leica CL -- with an effective RF base length longer than the CL, but not equal to a .72 magnification M6. The R or R2 will focus accurately all current Voigtlander lenses. However, the R2 does not have the long rangefinder effective baselength required to consistently and reliably close focus lenses like the 50/1, 75/1.4, 135/4 at full aperture and the closest focusing distance. Stop these same lenses down (to f/1.4 on the 50, f/2.8 on the 75, or f/8 on the 135) and the R2 will be able to give you accurate focusing through the range. In other words, the shorter rangefinder on the R or R2 will exceed its focusing accuracy close up and wide open with longer fast lenses, but it will be fine wide open at infinity or at close focus stopped down. There are probably other lenses which could damage the R2's shutter, so exercise good sense and caution when mounting ANY deeply recessed lens or collapsible lens for the 1st time. I'm told the 50/2 Collapsible Summicron and current version of the new version 50/2.8 Elmar can be collapsed into the R2 body without any damage to the camera or lens -- but be careful since there are lens variations. Personally my favorite collapsible Leica lens is the uncoated 50/2 Summar, made between 1933 to 1940. It gives beautiful semi-soft focus effects and muted colors wide open to about f/4 -- great for landscapes or women. Happily, the Summar fits just fine on the R2 (with a screw mount to bayonet mount adapter), collapsing almost completely into the body. There are probably some collapsible or deeply recessed lenses which could damage the R2's shutter, so exercise good sense and caution when mounting ANY deeply recessed lens or collapsible lens for the 1st time. Even the collapsible lenses listed here as being OK do have an unknown number of variations. Remember to push in collapsible lenses GENTLY to avoid problems. The collapsible Voigtlander 50/2 Heliar CAN be safely collapsed into ALL Cosina Voigtlander Bessas. The Rollei RF is a slighted modified Bessa R2, painted silver with 40 / 50/ 80mm framelines instead of the R2's 35/50/75/90 framelines, and with minor cosmetic changes including a different body covering. Rollei marketed a screw mount (with M adapter) 40/2.8 and 80/2.8 for it, along with a silver painted Rollei trigger winder and Rollei 40mm brightline viewfinder. A Rollei 25 lens was announced, but apparently never sold to the public. 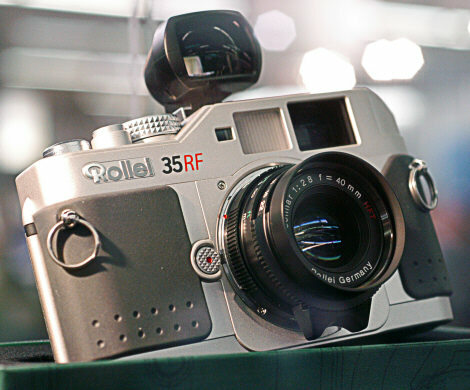 With an initial retail price much higher than its Voigtlander brother, the Rollei RF was not that successful sales wise. Large discounts were available once it was discontinued. The Rollei RF is pictured here on display at Photokina 2004. The Rollei assembled 40/2.8 and 80/2.8 Zeiss optics in Cosina made lens barrels enjoy very high reputations. Revised: September 10, 2017 . Copyright © 2002-2013 Stephen Gandy. All rights reserved. This means you may NOT copy and re-use the text or the pictures in ANY other internet or printed publication of ANY kind. Information in this document is subject to change without notice. Other products and companies referred to herein are trademarks or registered trademarks of their respective companies or mark holders.